If you’re interested in AWS Lambda and other function-as-a-service platforms and paradigms, we have a new newsletter coming soon (edited by IBM’s Raymond Camden). See how the exact same real world blogging platform (with the same API) is built using React or Angular on top of Node, Rails, and Django. With Rollbar, automatically know what’s broken and why. 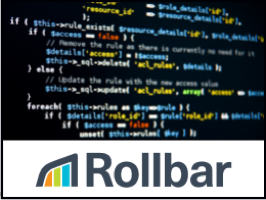 Rollbar detects and alerts you via Slack and HipChat when code breaks. Get stack trace and user data to help you catch errors before your users do. Google’s ‘Cloud Endpoints’ makes it easy to build OpenAPI-compliant APIs which then assists in cross-cloud setups. This post demonstrates invoking a Cloud Endpoints API from AWS’s ‘serverless’ Lambda platform. By eliminating infrastructure management, the serverless approach pushes many security concerns on to the provider, but this doesn’t solve every issue. linkerd is a proxy that sits in front of your apps and adds service discovery, routing, failure handling, and more. We love Heroku, but if you’re running thousands of dynos, other solutions may be more viable. Migrating, however, can be a tricky business. 1.13.0 is the start of a new mainline branch. It adds support for 308 redirects, TLSv1.3, and SSL renegotiation on backend connections. Work with a dynamic team and be responsible for reliability, scalability, performance, and automation capabilities of our core infrastructure. It’s a lighter stack that all new Heroku apps will use from May. If you’re a Reddit fan, check out this new sub-Reddit we’re working on. .. with over 220,000 cores running at once. Track app performance alongside metrics from your infrastructure. Troubleshoot latency issues with end-to-end tracing. There’s better ways to do this already built into HTTP. If your admin AWS credentials end up on GitHub, you won’t have a good time. Docker’s CEO says wrapping older, monolithic apps in containers provides major benefits.